The first time you laid eyes on the iPad Pro, your reaction was probably something like “Wow, this thing is huge!” I’ve been using mine daily since buying one on launch day in mid-November, and continue to be astounded at just how large the screen is whenever I pick it up. The sheer size of Apple’s largest iPad has changed the way we look at tablet devices. At 12.9 inches, the display is nearly identical to a 13-inch MacBook, which is traditionally used on the lap instead of held in yours hands. To paraphrase that infamous Steve Jobs quote about iPhone 4 antenna reception, maybe we’re just holding it wrong. Since 1986, Maclocks has been providing Apple fans with security locks, stands, and enclosures for nearly all of the company’s hardware products. The latest is the Grip and Dock iPad Security Stand, which promises a “new standard” for securing mobile tablets like the iPad Pro. Priced at $150, the stand consists of two pieces: A black, all-steel base which mounts to a table or desk, and a hand grip with adjustable Velcro strap that affixes to the back of an iPad using pads made from 3M VHB tape. Once bonded, this adhesive is strong enough that it can actually replace screws, so you’ll need a generous helping of Goo-Gone should you later decide to remove it. That bond is the most mission-critical part of the package, because the hand grip slides onto the stand, where even the enormous iPad Pro can be rotated 360 degrees while in portrait or landscape orientation. The stand can accommodate any iPad model, and Maclocks offers optional accessories including protective bands, shoulder straps, and screen protectors, which I wasn’t able to test with the unit provided for this review. Perfect for point of sale or retail kiosks, the Security Stand works equally well mounted to a desk or workstation where unfettered access is a must. Screws are provided for rotation mounting; fixed mounting is also an option, but the required screws are not included. In either case, the stand can be angled up to 45 degrees for maximum visibility. The construction is well-built, solid, and easy to set up, with simple printed instructions detailing how to get started. Assembling the stand requires a half-inch wrench (not included) and for best performance, Maclocks recommends allowing 12 hours for the hand grip to bond to the back of the iPad. But convenient access is only half the equation: True to its namesake, Maclocks also includes a security lock built into the docking stand. With the hand grip in place, insert and turn one of the two provided keys into the back of the stand, and a heavy-duty pin slides into place through a hole in the steel plate, preventing the tablet from being removed without a considerable amount of force. 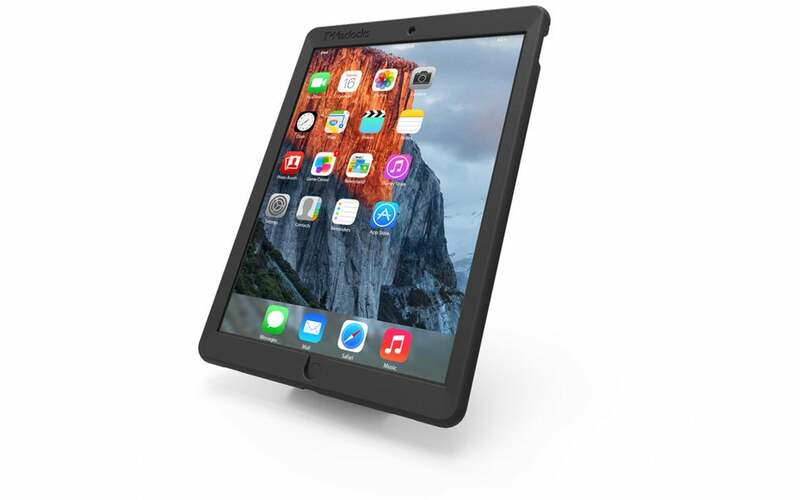 The hand grip also provides sturdy support for holding the tablet while in use, although at 1.59 pounds for a caseless iPad Pro Wi-Fi + Cellular model, it’s not a comfortable experience for long-term, casual use. The grip works with right- or left-handed users but clearly favors the former, so southpaws will need to adjust accordingly. 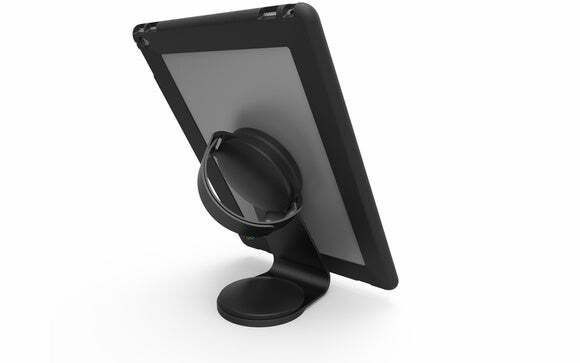 For small business owners in a retail environment, the Grip and Dock iPad Security Stand is a no-brainer: It’s a cost-effective, convenient way to secure even the largest iPad and hold it snugly while in use. Outside of a kitchen or workshop, it’s probably overkill for most consumers, especially when the tablet has to bonded so securely to the hand grip, making it difficult to use later with a standard case.